Suggest an art museum visit and most likely the traditional venues, Joslyn and Sheldon will enter the conversation first. For the more adventurous, an overnighter to Kansas City and the Kemper might be mentioned too. But for day-trippers anxious to get out of Dodge, the region offers an interesting array of art appreciation within a 100 or so mile radius. Des Moines and Sioux City are logical targets, but for a more comprehensive list of unlikely, unknown options, stay tuned as the Reader begins a series of articles that highlight several for your viewing exploration. Just 66 miles due west of Omaha via NE-92 and 15, the simple storefront that houses the Bone Creek Museum of Agrarian Art can be found just off the square in David City, Nebraska. Bone Creek is one of Nebraska’s hidden gems, nationally recognized as the only museum of agrarian art in the country and often included in any list of the four top museums in Nebraska. In addition, the museum is known nationally for its collection of works by native son Dale Nichols. Nichols name is often mentioned along with Thomas Hart Benton, Grant Wood and John Steuart Curry as America’s four most influential and notable regionalist/agrarian artists. The museum is the national center for Nichol’s Studies, and they house information, letters and drawings and other Nichols memorabilia. But sweetening the deal and making the one and half hour trek even more rewarding is a chance to see Bone Creek’s major exhibition, 150 for Nebraska’s 150th, that, as its title suggests, honors the state’s anniversary while recognizing an equal number of its artists. The prodigious exhibit continues until July 30 as it easily falls within the museum’s mission, Nebraska style. Our relationship to the land (and it to us) has motivated and affected art for thousands of years. The earth, the land, water, and ice, the flora and fauna, have inspired and infected people’s minds across the world, since the first cave paintings. Agricultural themes can be found in the art and craft of virtually any people of any time period. Agrarianism as a movement in this country was at first a social and political philosophy that put the values of rural society, environmentalism, and farming, above or superior to that of urban society, with the independent farmer being superior to the common worker. Many of the more famous artists associated with the early Agrarian art movement were active or former farmers, or had a direct association with rural or agricultural life or the processing of agricultural products. Artist such as Benton, N.C. Wyeth, son Andrew and his son Jamie, Clifford Still and Diego Rivera to just name a few. Today, Agrarian art has come to mean any art that is inspired by, or is about, our relationship with the land and all things associated; from native prairies to rivers and pristine wilderness, to farming and cultivation, husbandry, mining, land use issues and wildlife. 150 for Nebraska’s 150 has been a huge success for the museum as well as the artists. Over 50 pieces have sold at the time of this writing, a testament to the quality and accessible pricing of these smaller works. The unpretentious exhibit is a collection of works from around the country, put together by Curator Amanda Mobley Guenther and Collections Manager Gabrielle Comte. The museum, divided into two galleries, is arranged comfortably and well lit. A few groupings felt slightly crowded, but the logistics of arranging, in a small gallery space, 150 works of varying size and media, must have been daunting. Give kudos to the staff for making it work without too much viewer discomfort. Submittals for the show were required to be 11 x 14 inches or less. With 150 works to be displayed, this was an obvious necessity. Much of the work includes the ubiquitous fields, barns, cows, and roosters; but that is an obvious outcome from an agrarian-themed show, and most of the art is of superior quality. “Pivot,” by glass artist Steven Ramsey, head of Glass and Sculpture at University of Nebraska at Kearney, is a delightful and elegant optical illusion sculpture of the circle pattern left by pivot style irrigators. 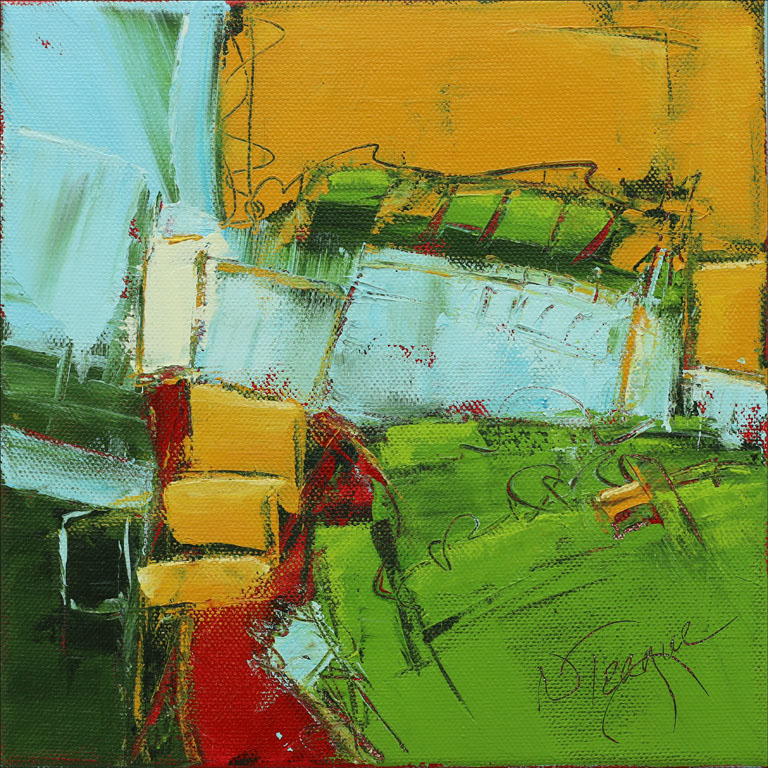 Nancy Teague’s “Over Yonder,” an acrylic abstract on canvas that takes the essence of that archaic, grey phrase and brings it into our current colorful lexicon. 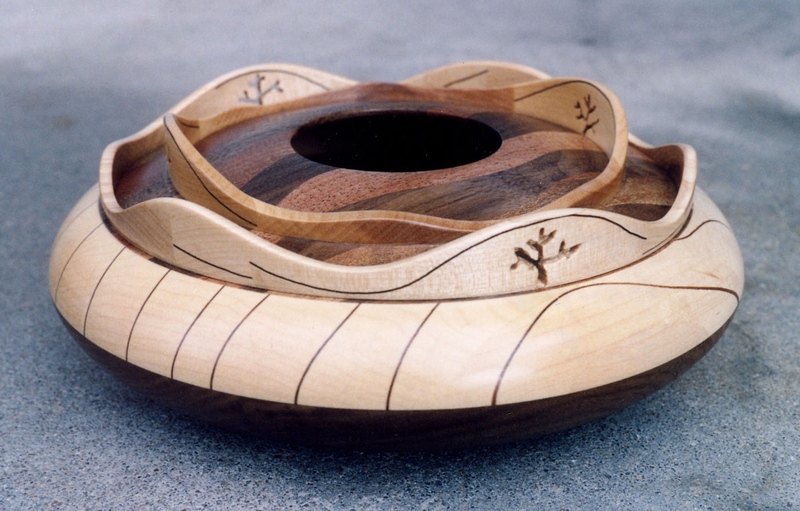 Dennis Wattier’s “East to West,” a turned-wood bowl, handsomely captures the sinuous contours of the rolling land, without becoming overly decorative. Ruth Philiben’s “The Silo,” is a sketchy, gestural watercolor and ink drawing that at first comes off as a study for a future detailed painting, but is simple and honest and stands as a final piece. 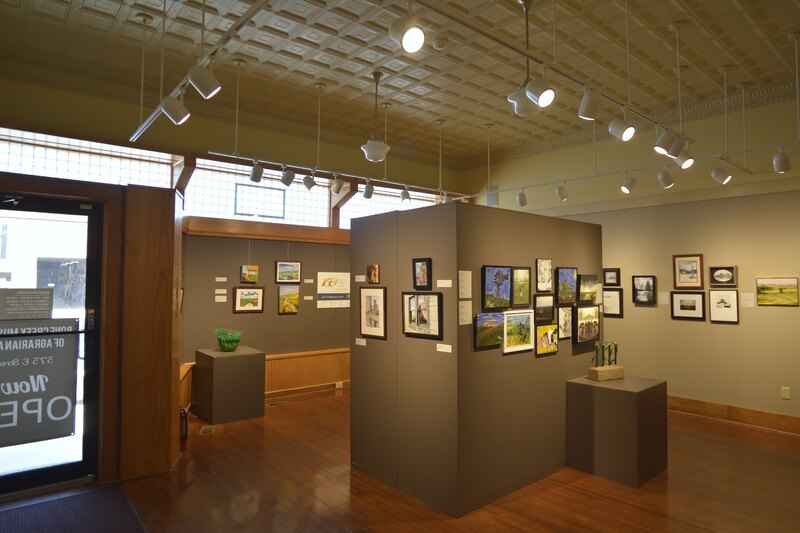 A large kiosk in the front gallery displayed work from younger, student artists. 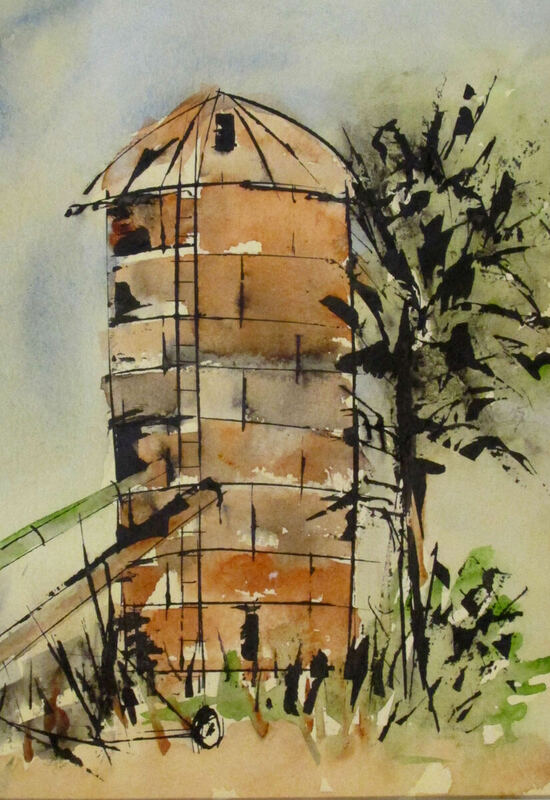 Three of the pieces of note: a watercolor by Michael Bristol entitled “Reflections of an Ageing Giant,” a detailed and iconic rendering of a grain silo and elevator, evidence of a talented illustrator with a keen eye for depth and composition. Also Look for a graphite drawing from Astrid Mejia, a highly detailed, if somewhat disturbing portrait of a man/cow/pig chimera that might just be a statement about the possible dangers of GMO’s. Lastly, a glass mosaic from Austin Povlika entitled “Big Green Combine.” This interesting, somewhat abstract work was one of only a couple of mosaics, a notably less popular medium. 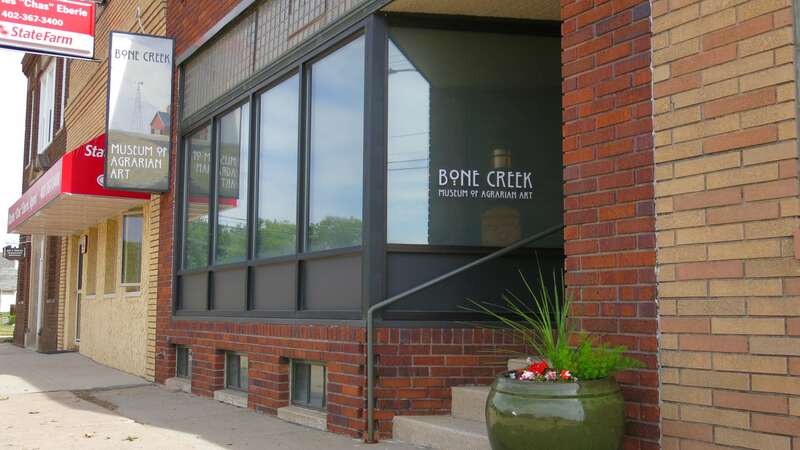 Bone Creek Museum operates with a very small staff, and a large contingent of volunteers. 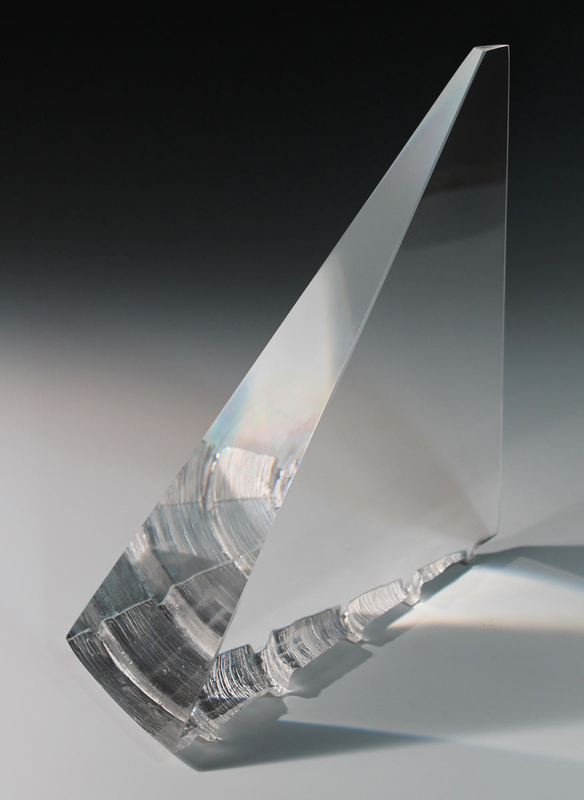 They have won numerous awards and grants, most recently the Rising Star Award from the NEBRASKALand Foundation. The award recognizes outstanding tourism attractions exhibiting successful efforts economic and social fronts. Although their main focus has been on artist Dale Nichols, the Bone Creek Museum does house other collections of note. They have a sizeable collection of works by Luigi Lucioni (1900-1988), a painter and print maker who emigrated to the US as a young boy, and who’s detailed etchings depict laconic, natural settings. Lucioni, known also for his detailed still life and realistic portraiture, is purported to be the first and youngest contemporary artist to sell a work to the New York Metropolitan Museum of Art. Other collections housed at the Museum include works by Edward Glannon(1911-1992), a painter and printmaker from Pennsylvania, who’s work is in many private and public collections; and Beth Van Hoesen(1926-2010), an eminent artist known for her poignant animal portraits who’s work is in more than 150 museums across the country. The Museum also has an extensive collection of cover art from Fortune magazine. From about 1930 to 1950, the magazine featured illustration by various artists depicting agrarian and rural imagery of the highest quality. Actually, Bone Creek needs bodies. No, not a trailer for a horror film; it is a plea to get more people out to David City Nebraska to visit the Bone Creek Museum and to support it by volunteering, joining, purchasing or bequeathing or all three. In the introductory brochure for The Ballad of the Farm exhibit, it states that their mission is to make “David City a destination for experiencing great art. Expanded facilities are part of this vision.” Their one real albatross is the size of their facility. This is not to say they haven’t done a superb job with the space they have. The exhibition areas, though small, are quite comfortable, beautifully finished, and well lit. The state-of-the-art art vault and workspace, required for accreditation with the American Association of Museums, is a testament to what you can do in confined areas. The museum offers a summer art camp for kids, has regular workshops (upcoming is a Raku firing workshop scheduled for July 8th,) and artist talks and receptions, museum tours for schools and other groups and an art library. A nicely designed newsletter comes with the basic membership to the Museum. Other membership levels are available and offer more perks. The website, bonecreek.org is designed well and easy to navigate. The current exhibit, 150 for Nebraska’s 150th, runs through July 30th. There will be a closing reception on Saturday, July 29th. Several artists are planning to attend. Unrestrained RefrainsCan I Buy You a Drink?